I heard you speak at Elliott Bay. Bought Hild and have been gone “back to Yorkshire” while reading it. I am the family historian for my extended Penrose family. Yes, we are Yorkshire Penroses from small places such as Skipwith, Foxholes, Langtoft, Burton Agnes, Huntington, Bainton, Hutton Cranswick. I have good documentation from 1731 to 1830s when the landless sons of Foxholes butcher decided to emigrate to America. Over past 45 years I’ve traveled to these small Yorks places, and always launched myself by bus, train or car from York, Leeds, Beverley, Hull, Scarborough, Filey. Whitby I have a memory of climbing from waterfront of a town on the east coast up to an abbey ruin. I think. All this is to say that I kept my Ordnance Survey maps of Yorks in my chair as I read Hild. Was forever matching place names in the book with those on your map in the book and with the Ordnance maps. I wonder if you or any of your readers have ever created a map of the route journeys made by Hild. I keep wondering, where is Menewood? What would it be near today? Would a Yorkshire reader be better able to identify specific wolds, valleys, monuments while reading Hild? I am now using Seattle Public Library and internet sources to get better informed about Bede, Celtic vs Roman religion, and so many more subjects. My pagan/Unitarian/Universalist spirituality has always urged me to learn and experience feminist spirituality and sources. Menewood is real: Meanwood Valley, in Leeds. Specifically, the bits I describe are absolutely real. 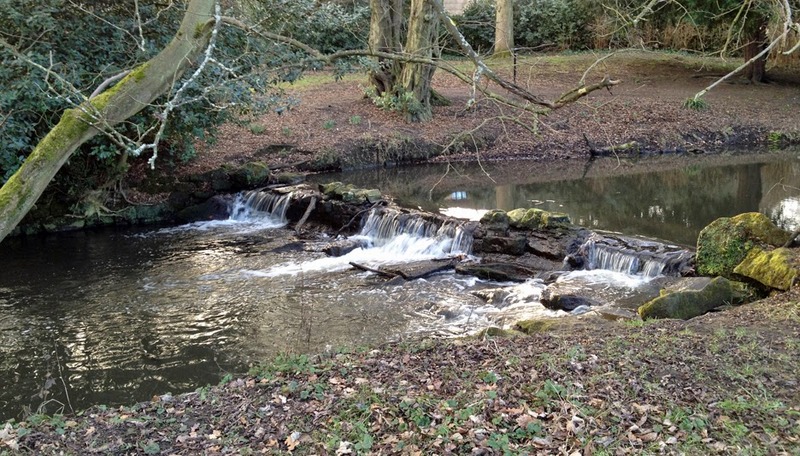 If you visit Meanwood Park you might recognise things here and there. Caer Loid is, in my imagination, the site of Kirkstall Abbey, also in Leeds. I’m deeply familiar with both places and for the book imagined how they might have looked 1400 years ago… You might enjoy this post I did a while ago, which includes these two photos I took on one of my recent trips to the UK: Kirkstall Abbey/Caer Loid and Menewood Beck/Meanwood Park in February 2013. Some valleys, rivers, folds, cliffs etc in the book will be instantly recognisable to natives. But some might not; so much has changed. (In the first photo, for example, I had to edit out signs of the 21st century, and both depict nature that’s entirely too tidy for Hild’s time.) But I tried to make sure that the flora and fauna, the weather, the kinds of dirt and rock, are plausibly those that might have been there. Every now and again I fudge a bit (I need Hild to be able to climb a substantial tree at the age of seven, say, and the trees that definitely would have been there would be impossible, so I import a less likely candidate–not impossible, just less likely), or make a mistake (sigh). But I’ve done my level best to keep things as real as possible. But no, no one has created a map of Hild’s journeys. I’d love to see it, if anyone did. One more thing. You might be interested in Seattle University’s Search for Meaning Book Festival, Saturday February 28. It runs all day but I’ll be talking about Hild at 1 pm. I like the pale blue background that takes up the blue of the photo and makes wide skies of the whole screen area. Welcome to wordpress! 🙂 It has a crisp modern look. I don’t recognize some of the icons under the blog title. The picture in the headers is small on my screen. I don’t know if that was intentional or not. Right now I’m just playing with a relatively uncustomisable theme–so I don’t get lost in CSS etc and so distracted from HILD II. I’m testing hosts and domains and the basic interface before I take the plunge with a whole new website. In a final version the titles would be better, the image different, and the icons totally identifiable! I just use the standard tools for Heavenfield. I only got a wider color palette for Contagions but nothing else special. There are tons of free themes that work well. Good move…for some reason I find myself avoiding blogs on Blogger…not sure why except it always feels so clunky, and writing a comment and getting it posted is pure torture there. BTW: I loved Hild, but I’m sure you’ve heard that a few times already. I have in fact heard that about Hild many times. But it never gets old! Sort of random question: where can I get an image of that lovely watercolor of Bamburgh Castle? The watercolour is by Norman McKillop. He gave me permission to use any way I’d like. (I made a donation to his favourite charity in lieu of payment.) I’m sorry to say I no longer have his address, but if you’d like to look at a larger size version, see here. Thank you! I found his website so I’ll try to contact him that way. Excellent. Say hello from me. I just finished Hild and loved it! When do you think more of her story will come? Your notes in the book indicated a sequel! I’m delighted you enjoyed it. When will the next be out? I don’t know! I’m working on it. It won’t be finished for a while and then the publication process takes a year or more. So…not soon.